The Focusing Attitude of being friendly and welcoming toward your inner experience. Getting a felt sense–useful for centering, grounding, and accessing the body's wisdom. Clearing a Space–helps to reduce stress and access an intrinsic state of wellbeing. Self-care–listening to what you need, identifying blocks and steps toward implementing self-care. Mindfulness meditation–3 exercises based on the teachings of the Venerable Thich Nhat Hanh. Focusing exercises follow to capture and ground the meditative state. 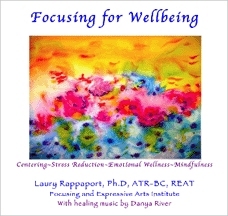 Healing music by Danya River gently accompanies the guided Focusing instructions in order to promote relaxation and enhance the Focusing process. Creative Arts Application: Suggestions for creative expression.